Almost exactly a year ago, Dzeko & Torres burst onto the scene with their outstanding remix of “Of Monsters And Men”. A few months later followed another two other hit remixes, one of which was picked up by the original artist (Chuckie) and played as the opener to his set. Who would have guessed that in under 12 months the Canadian duo would have gone from remixing to releasing a track with the Dutch superstar, “Down To This”? No wonder this incredible rise to fame has them giddy, and today they have decided to share that happiness with fans in the form of a free download. 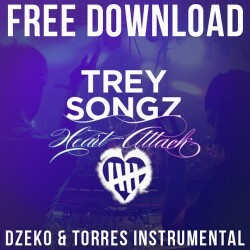 Taking Trey Songz’ “Heart Attack”, they have transformed it into a driving progressive house masterpiece, frosted with chip tune touches. Head to Soundcloud for the free download and keep up with the guys through their Rave’N podcast. Also, look for them at Digital Dreams in Toronto, alongside verteans like Paul van Dyk and Richie Hawtin. Loveskills announces new mixtape and shares remix of Trey Songz "Slow Motion"